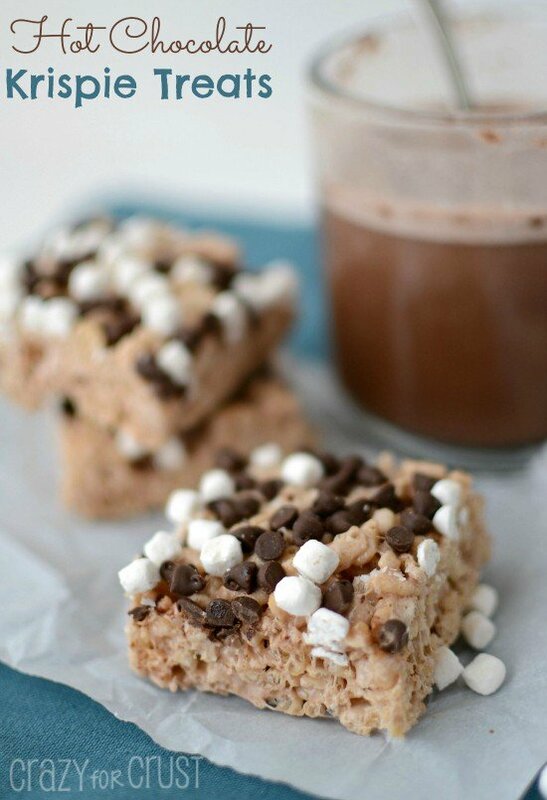 Hot Chocolate Krispie Treats taste like a mug of hot chocolate, but in a krispie treat! The ultimate comfort dessert to make you feel like a kid again. So, normally, I write posts ahead of time. Usually at least the day before I post, the words are written, the publish time is set. But today? I’m sitting at my computer and it’s 11:35 AM and this post is for today. And I’ve drawn a complete blank. I’m on borrowed time (well, Jordan’s BFF’s borrowed time – she has to be home at 1:00) and I’ve got nothing. It’s like waking up in the middle of the night and telling yourself, “I have two more hours to sleep” but then spending the following two hours counting down the actual minutes you have to sleep instead of, you know, actually sleeping. Today is the last day of Spring Break. Jordan has a friend over until 1:00 and then we have to run our errands (why, exactly, do library cards expire? With no notice? So you can’t check out a Kindle book when you need one?) and get ready for school tomorrow. So I have exactly 1 hour and 23 minutes to finish this post. One hour and 22 minutes. 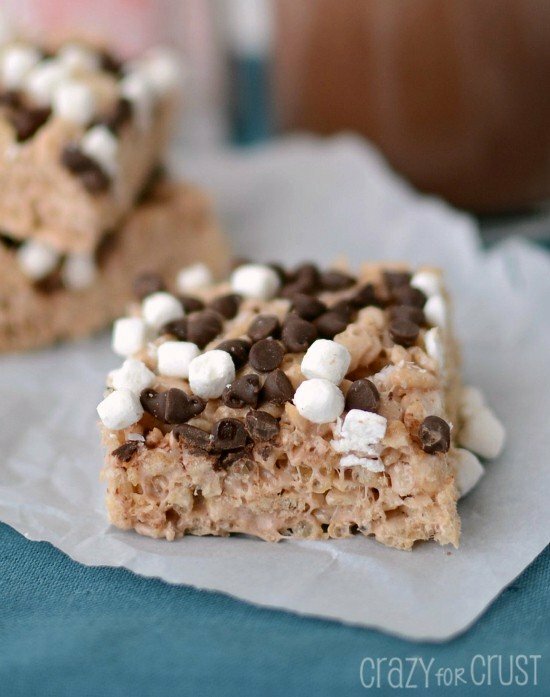 So, um, can we just talk Hot Chocolate Krispie Treats instead? For someone who loves eating rice krispie treats, I don’t have very many recipes for them on my blog. I think I need to remedy that. Because, really. I love them. Marshmallows, butter, Rice Krispies, flavoring. What’s not to love? A few weeks ago I said on Facebook that I had forgotten to make cookies for my daughters’ library book sale. I had a bout -45 minutes the following day and was thinking of buying cookies instead. Facebook properly chastised me, and told me to buck up and make something. So I did. These Hot Chocolate Kripie treats make up super quick. I had them in the pan in less than 10 minutes – I swear. You melt together your butter and marshmallows, stir in the packets of hot cocoa and cereal, and press into the pan. It would only have been faster if I could emit radioactive rays from my eyes and melt the marshmallows without having to open and close the microwave. 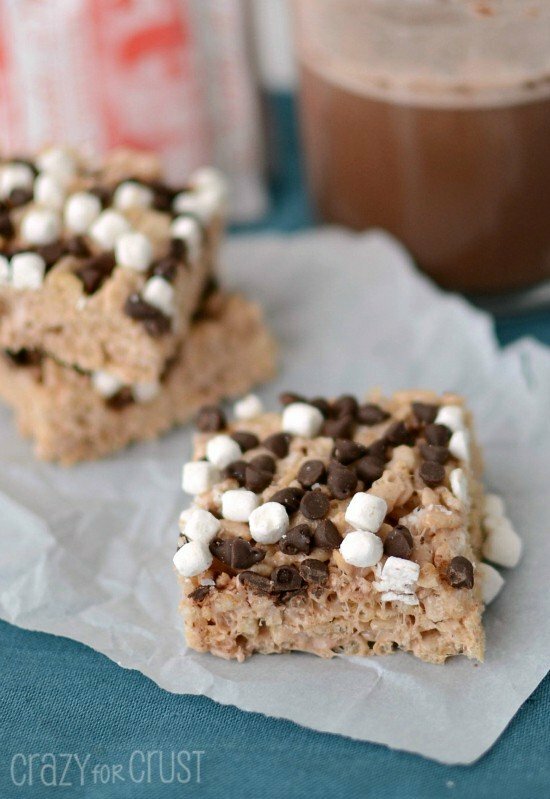 Because these are Hot Chocolate Krispie Treats, they needed extra marshmallows. So I added some Mallow Bits (they come in those canisters you don’t want to confuse with the parmesan cheese) and mini chocolate chips on the top. You press them in as soon as you put the treats in the pan, quick before they cool. As the treats cool, the chips and mallow bits stick to the top. Cool, cut, and serve. 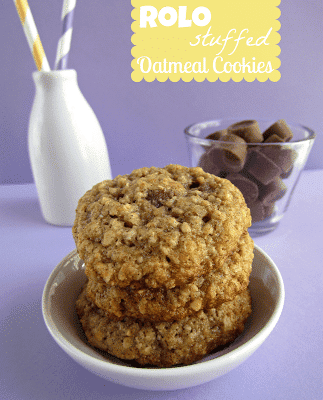 If you use the fridge to aid in cooling these are start to finish in less than 45 minutes. Seriously. 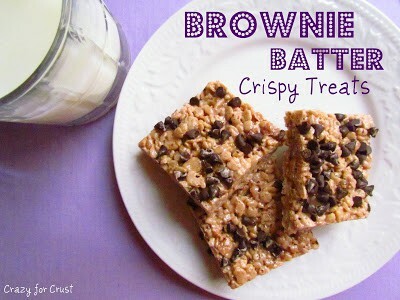 And these Hot Chocolate Krispie Treats are like the perfect comfort food. Crunchy chewy hot chocolate. The perfect treat for when you don’t have a lot of time. Line a 9x13” pan with foil and spray it with cooking spray. Keep the cooking spray close by. Measure out cereal into a large bowl and set aside. Place butter and marshmallows in a large, microwave safe bowl. Melt for 1 1/2 to 2 minutes on HIGH power, stirring every 30 seconds until they are melted. Stir in the hot chocolate packets. Stir in the cereal and pour into prepared pan. Working quickly, spray your hands with cooking spray so they won’t stick to the mixture, and carefully press the treats into the pan. (Be careful - the mixture will be hot.) Sprinkle immediately with Mallow Bits and mini chocolate chips and press lightly to secure them to the top of the krispie treats. Let cool completely before cutting into squares. Cheesecake Rice Krispies by Mallow & Co. Try them using a whole stick of butter. Your life will never be the same! 🙂 Looks awesome! LOL!! Of course it would be amazing! Sounds so good! I could probably finish the whole tray (which is what I usually do)! But I’m wondering how much is two packets of hot chocolate? Two packets of the packaged kind you can get in the grocery aisle, like Swiss Miss. All of mine are packed away for my kitchen remodel right now so I’d have nowhere to look to see the ounces/pack I’m guessing they have about 2 tablespoons or so of mix per pack. If you’re using a canister with a scoop, use two servings!